Hybrid routing options – configure with Cat-X, Fiber or any combination of both. Hot swappable modules – update or repair without powering down system. Redundant power– add up to two additional backup power supplies for load sharing. SFP option modules allow KVM or SDI capabilities in the same frame. High density fiber allows efficient cabling and lower weight. Combine DVI, HDMI, USB, Audio and RS-232 in the same frame. SFP option supports SDI, HD-SDI, and 3G-SDI formats. Agnostic port assignments can be configured from one to 287 CPU or CON. Front loading interface cards, power supplies and control cards. Local monitor, keyboard and mouse connections for system monitoring. Build systems in blocks of 8 ports per interface card. The Draco tera enterprise hybrid fiber/cat-x switch matrix offers advanced features for large scale KVM class signal routing such as instant switching and flex-port technology allowing any port to act as either a CPU (TX) or Console (RX) depending on the connected device. The Draco tera enterprise is ideal for the space constrained work areas such as mobile production, production studios or command and control environments. Each switch matrix can be populated in groups of 8 ports in either fiber or cat-X. Additionally, the switch matrix can be populated as a full fiber, full cat-x or a mix of fiber/cat-x based on custom requirements. The switch matrix supports an endless possibility of HDMI, DVI, SDI, HD-SDI, Dual Link DVI, USB, audio and serial interfaces. With the tera enterprise flex-port technology each I/O port can be configured as an input or output thus reducing the requirement for dedicated port configuration. 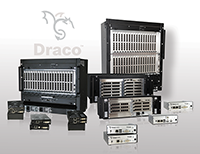 Once a Draco extender is connected, it is clearly defined with an identification number (ID) to assign the device as a CPU (TX) or console unit (RX). IHSE USA’s advanced control interface allows a wide range of operations for OSD (on screen display), Browser based JAVA applications or RS-232 control. For systems requiring third-party control, the IHSE USA control protocol is compatible with popular 3rd party control systems.